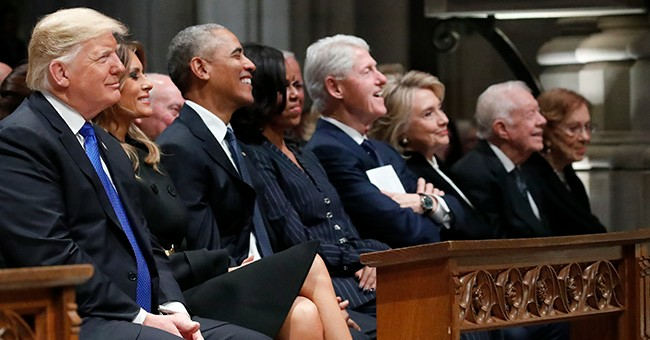 The funeral that celebrated the life of George H.W. Bush brought out the best and the worst of our media-driven culture of snark and insult. The ceremonies at the Capitol and the National Cathedral, which showed a son, a former president, mourning his father, a former president, brought tears to many a spectator's eye. Some of the tears were for the passing of more than a man, of a kinder, gentler time as well. President Trump, whom hostile pundits went out of their way to demean with unartful and artificially contrived comparisons to the late president, showed dignity in honoring a man who had left word that he wanted Trump to be invited to his funeral. No. 41 wanted his countrymen in mourning to reflect on what every man and woman in the land hold dear, not our divisions. The 41st president was as noble in death as he was in life. "If there's anybody that spoke to bipartisanship and rising above politics today, that would be my grandfather," young George P. Bush, son of Jeb Bush and elected Texas state land commissioner, told CNN News. The interviewers seemed surprised by the sentiment, and one reminded him of Trump's angry words against members of the Bush family. The grandson didn't bite. "(T)here's a time for politics and there's a time for governing," he replied, "but there's also a time for reflection, and this is a time for reflection, for our country to think about the values that make our country great." He recalled political campaigns of his grandfather and the sometimes-rough rhetoric, even from Ronald Reagan. His grandfather, father and uncle had learned that in politics, as in other challenges in life, "you get up and you fight again." Rhetoric "hurts and stings" sometimes, but reconciliation has its virtues: "It's important for the country to take this time and reflect on the commonalities that we have rather than the differences." The death of George H.W. Bush played out as less a tragedy for an honorable man who lived to be 94 than as a history play, reminding everyone of his formidable foreign policy accomplishments more than stellar domestic triumphs. If there were bitter elements in the Bush political theater, one that stood above the others was the revenge of Ross Perot, who as a third party candidate called for "economic nationalism" (sound familiar?) and capitalized on the anger at Bush for breaking his promise not to raise taxes after giving his dramatic, iron-clad word that he never would. Perot diverted enough Republican votes to elect Bill Clinton. While the nation was mourning the man of uncommon mettle, the Kennedy Center was honoring pop culture stars in a mixed bag of artists, some better known than others. They included Philip Glass, a minimalist composer whose humility shone through in his puckish surprise at receiving a medal because many Americans had never heard his esoteric music, as well as Cher, who seemed surprised that many Americans who had heard her music would still choose her. Few were surprised that President Trump and the first lady skipped the Kennedy Center Honors for a second year. Last year, one honoree threatened to not show up if Trump would be there, and Trump said he was absent to allow the "artists to celebrate without any political distraction." The First Couple was criticized for not being there, of course. But this year, Cher, who graciously described the president as "Hitler" and did not join in the reconciliation spirit of George H.W. Bush, was "thrilled" the Trumps weren't going to show. If they had, she would have received her "little honor in the bathroom." Since one honoree was "Hamilton," the rap musical, the president and the first lady were spared what happened when Vice President-elect Mike Pence attended a "Hamilton" performance in New York. When the final curtain fell, an actor broke through the fourth wall to directly accuse him of alarming a diverse America, who was fearful the administration would not protect "our planet, our children, our parents ... our inalienable rights." The actor, who had played Aaron Burr, the villain who shot Alexander Hamilton, spoiled the magic of the moment, erasing the catharsis that came from watching a talented multiracial, multicultural cast sing and dance about a famous time in the nation's history. The spirit of George H. W. Bush demonstrated how to be bigger than that, teaching at the end of a long life well-lived a lesson of reconciliation our times could sorely use. Shakespeare's Puck, in "A Midsummer Night's Dream," got it right for our age: "What fools these mortals be."